For allergy sufferers and individuals dealing with a variety of respiratory conditions, it is crucial to maintain clean indoor air for symptom relief and to improve the quality of poor indoor air. Climatrol Inc. has been serving the needs of residential and commercial customers in Clarksburg, Bridgeport, and throughout our West Virginia service area for over four decades by offering efficient solutions to bring cleaner and healthier air into the homes and businesses of our valued customers. We will work with you to determine your needs and offer cost-effective solutions to make breathing easier, help keep your house cleaner, and help your HVAC equipment last longer. Our high-quality air cleaners deliver exceptional performance. Designed for endurance and high-performance, our air cleaners work with your heating and cooling system to sterilize air as it passes through your system. Conditioned air from your furnace or central air conditioner passes through your entire home or office. If it is saturated with contaminants such as pollution, mold spores, dust mites, viruses, bacteria, pet dander, and other pathogens, the effects can be quite harmful. 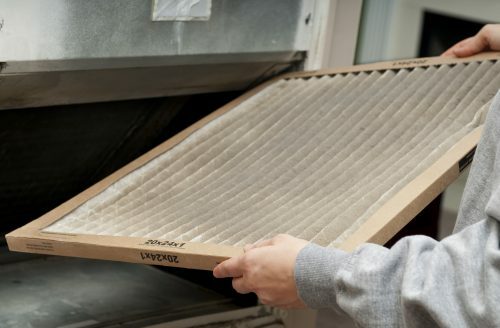 Your air filters must be replaced at least twice per year. This is an important preventive step to protect the mechanical components of your HVAC system. Advanced filtration and sterilization are a wise investment to help prevent the development of, and alleviate symptoms of poor health, including coughing, sneezing, itchy/painful eyes, and similar symptoms. The influenza virus, as well as other dangerous viruses and bacteria are known to flourish in unclean ductwork. For most customers, the professionals at Climatrol recommend that your ductwork be thoroughly cleaned on an annual basis, as well. For maximum cleanliness and the most sanitary home possible with less dust and debris dispersal, it is advisable to add a professional-grade air cleaner to your climate control system. Contact the friendly staff members at Climatrol to learn more about how we can help you maintain a cleaner, fresher home environment. To request a quote or schedule a consultation, contact us at: (304) 623-0606.